Dubrovnik is a Renaissance paradise to millions of people from George Bernard Shaw to the lady to next door. As Croatia’s most visited city and a global destination, Dubrovnik is easy to get to by bus or plane from Zagreb, by ferry from Split or even further up the coast and there are lots of direct flights and charters from all over Europe. We like Dubrovnik, but there is something oddly remote about the place every time we visit. It’s as it the city is all skin and no heart, lacking the charm and sense of life that one finds in so many other Croatian cities. While it’s wonderful to walk the walls above the Old Town, gaze out at the sea and look down on those fabled red-tiled roofs (the buildings are glorious), to us, Dubrovnik has a distinct museum-like quality of “look but don’t touch”. Part of this is because it is such a famous, well-deserved UNESCO World Heritage site as well as the main port of call in Croatia for cruise ships doing the Venice-Athens route. The walled city and its single main promenade, called the Stradun, simply can’t cope. The sheer number of people—thousands every day–who come by sea and air and make Dubrovnik the most intensely-crowded city in the country. When it gets shockingly hot as it does most of the summer, everyone desperately tries to find non-existent shade. Our advice is get there really early or after sunset. During the day, head out to Korcula or Miljet or take the water taxi to Cavtat where you can jump in the crystal sea and cool off. 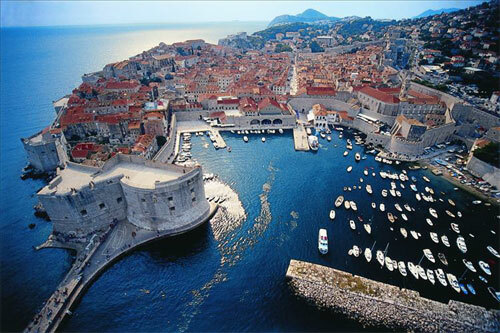 If you can plan your trip in the Spring or Fall, you will really get the most out of you visit to Dubrovnik! –the city’s only English language weekly, authoritative and complete! Sibenik, the only Croatian city with two UNESCO sites!